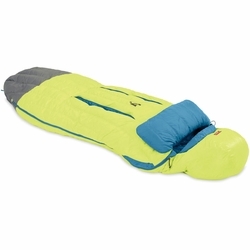 NEMO Disco 30 Spoon Shaped Sleeping Bag. Seventy percent of people sleep on their side, but mummy bags are not designed to accommodate this. With a unique Spoon™ shape adding room at the elbows and knees, The Disco™ is a three-season down men’s backpacking bag that is designed for side sleepers, and allows you to shift positions throughout the night.